Fashion Bug, Sri Lanka’s leading fashion destination, dazzled the audience as they unveiled this year’s seasonal collection at Serenade, a fashion show attended by their elite clientele, which was held at Jie Jie Beach by Jetwing recently. 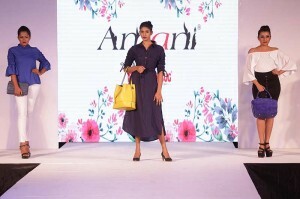 The two brands that walked the ramp were Fashion Bug’s own household ladies’ collection, Amani and Nellrose, the unique local brand which was exclusively launched at the Wellawatte outlet a few months ago. The designs together shared a glimpse of what Fashion Bug would house for the coming season, highlighting the casual and office wear ranges. The casual wear collection contains a touch of floral inspiration adding a soft elegance that suits the modern woman. The Blue themed office wear range promises to be a ‘must-include-in-your-wardrobe’ item for the New Year with its blend of comfortable and fashionably smart ladies’ wear. In addition, a range of casual saris from the Ethnic Fusion collection, perfect for evening functions and cocktails, flowed down the ramp in a kaleidoscope of colour. Nellrose, a totally local brand, offers unique designs to fashionable ladies. Inspired by stylish ladies being comfortable and confident in Nellrose clothes, only a limited number of pieces are manufactured from each design because ladies desire to be exceptional. Fashion Bug’s very own brand Amani, is one of the most valued brands by its customers. The colourful designs are made to suit customer needs taking to account the latest trends and seasonality. “Sri Lanka’s fashion demands are fast evolving. As one of the leaders in the industry we are committed to cater to these dynamics. Whilst incorporating global fashion trends, it is also our responsibility to shed the limelight on our local designs, and this is why we have collections from two local designers walking the ramp,” commented Shabier Subian, Director of Fashion Bug.